Today I came across a comment on WUWT by the Village Idiot. Village Idiot was responding to an article by Ira Glickstein looking at the differences in projections in the various IPCC reports (archived here, update here). 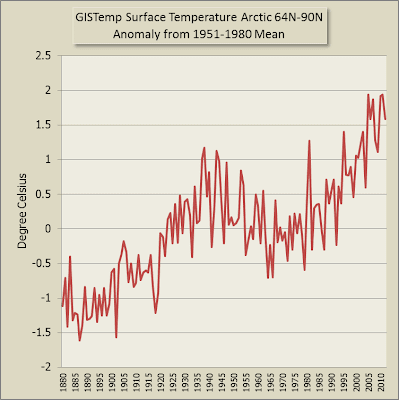 Where is all Easterbrook’s cold hiding? I think some of its going into the extra ice in the Antarctic. Any other suggestions? The sun’s recent behavior suggests we are likely heading for a deeper global cooling than the 1945-1977 cool period and ought to be looking ahead to cope with it. 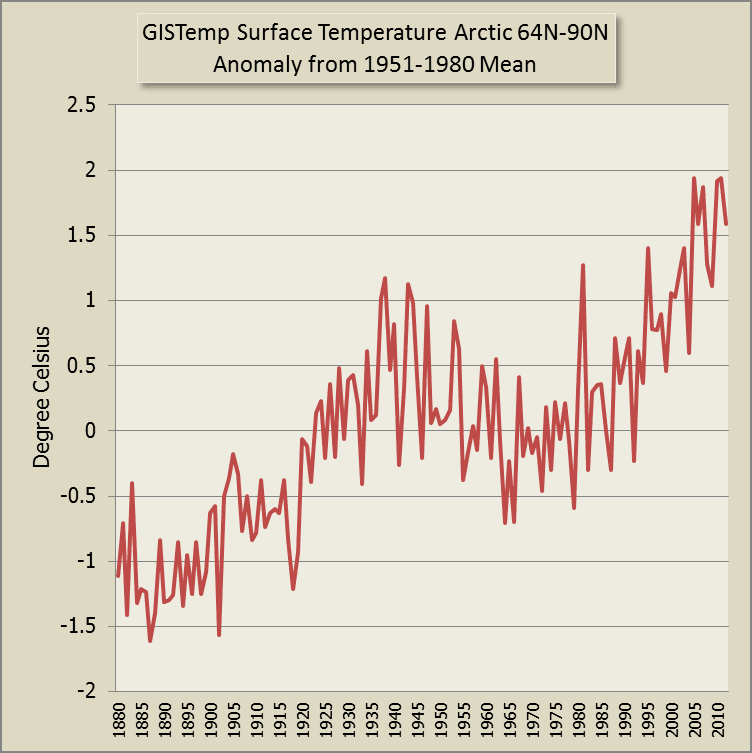 What is causing the warming? I looked back to see what Ira Glickstein has done in the past at WUWT. Two and a half years ago he took a poll of WUWT readers (archived here) to see how much they thought global warming of 0.8 degrees Celsius should be apportioned to three things. The results in degree Celsisus were as follows - all to 3 decimal places! It's a fairly good example of wishful thinking, particularly the emphasis many people put on data bias. A quick search didn't lead me to any quantitative prediction Ira has made in the past in relation to global surface temperature. However, for the record, he has today made a prediction for the temperature in 2035. He predicts no change from the current surface temperature between now and 2035. Ira did an interesting comparison of projections from previous IPCC reports with those of the current report. I don't think he was correct in highlighting the mean of the projections, but that's a relatively minor quibble. Rather than show his chart, I made up one of my own into an animation, flipping through the previous and current projections and showing Ira's projection compared to the current AR5 range. As always, click the image to see the larger version. I’m optimistic about the future! Unlike some of the Alarmists and Warmists who actually hope for a climate catastrophe to justify their decades of shrill Catastrophic Anthropogenic Global Warming (CAGW) warnings, I’d prefer a future without such problems. Indeed, I hope that the cooling trends listed above do not result in excessive cooling which would be far more dangerous than the moderate warming we have experienced over the past century. Attributing nefarious intent, as Ira does, is a feature of conspiracy ideation. I'm not saying that Ira is a conspiracy theorist, but he's clearly inclined towards it by saying that "Alarmists and Warmists" actually hope for a climate catastrophe. Why are science deniers so silly about this. Why on earth would people who understand science be wanting to reduce carbon emissions if we were "hoping for a climate catastrophe"? We'd be working against achieving our goal! Logic is not a strong suit of science deniers. And it's odd how deniers are unable to face facts. Cooling trends? What cooling trends, Ira? How hot do we want to get? So far there haven't been very many comments at WUWT (archived here, update here). I guess most readers are still asleep. There was a bit of to-ing and fro-ing on the matter of "projections" versus "predictions". Then the Village Idiot chimed in with his "where is the cooling hiding" question. It is to be hoped your presentation will evoke the serious discussion it deserves concerning the failure of past IPCC predictions and the adherence of IPCC AR5 to ECS estimates which are obviously too high. I am sorry such discussion has been inhibited by the start of the thread being trolled by the ‘red herrings’ of Terry Oldberg and Village Idiot. Take pleasure from the knowledge that they would not have bothered to try side-tracking the thread if your point were not made well. Oldberg knows he is spouting nonsense because it has been explained to him several times on many WUWT threads. The Idiot only ever spouts nonsense with intention of disrupting threads. It says: “” 3) We seem to be entering a downturn in the multi-decadal cycle of warming and cooling. ……. An approximately 60-year cycle of warming and cooling seems to be superimposed on that general warming trend ……..”"
science will take a closer look into this cycle nd will determine its detailed celestial mechanics…. its just a matter of some more time. less incoming heat, due to astronomical changes in the Earth´s orbit. 1) IPCC ECS estimates are two or three times too high. I believe the true ECS is closer to 1°C than the 2°C to 3°C claimed by the official climate Team. That belief is on direct contradiction with evidence from the paleoclimate. It is very difficult to make such low ECS values compatible with the glacial cycles. 2) Daytime clouds, thunderstorms and related natural phenomena have net cooling effects. The way these phenomena are modeled by the IPCC models is basically wrong. I subscribe to the Thermostat Hypothesis put forth in 2009 by Willis Eschenbach that these phenomena counteract some of the warming effects of greenhouse gasses. As Dr Spencer has pointed out the thermostat hypothesis was proposed by many other before willis Eschenbach co opted it. Empirical observation has failed to find any supporting evidence for such negative feedbacks ever since Lindzen and the failure of the iris hypothesis. PS I'd take my hat off to Village Idiot if I wore a hat. She or he provides a source of well-targeted humour to alleviate the boredom of wading through mindless comments from the scientific illiterati at WUWT. "I'm not saying that Ira is a conspiracy theorist, but he's clearly inclined towards it by saying that 'Alarmists and Warmists' actually hope for a climate catastrophe." "If anything, I would like to see the climate change happen, so the science could be proved right, regardless of the consequences." So, here is one of the main university and government-funded experts, who has been predicting catastrophic climate change due to human activities, confronted by and admitting (at that time) some 15 years of no significant warming in the face of continued rapid rise in CO2 levels, actually wanting to see his warnings come to pass "REGARDLESS OF THE CONSEQUENCES." In other words, he is willing, even anxious, to see catastrophic climate change happen, to retain his prestigious job and scientific reputation, even if it results in the sacrifice of his family, including young children, as well a yours and mine. Ira, care to cite any papers from Phil Jones in which he predicts "catastrophic climate change"? IPCC, me and whoever will get accused of being political, whatever we do. As you know, I'm not political. If anything, I would like to see the climate change happen, so the science could be proved right, regardless of the consequences. This isn't being political, it is being selfish. Interestingly, the email was written to John Christy. What an idiot. The scientific community would come down on me in no uncertain terms if I said the world had cooled from 1998. OK it has but it is only 7 years of data and it isn't statistically significant. It's funny how the context (and the correct numbers) are strongly at odds with Ira's version of reality. OMG - you really take the cake, don't you. I've learnt more about you from that comment than I have in your entire article. Your comment illustrates only too well why normal people despise the paranoid conspiracising illiterati. You are not content to deny the science. You want to stick the boot into a scientist who's spent his working life finding out about the risks humanity faces, only to come up against scum whose sole aim is to shoot the messenger. What is illuminating is that you take a single comment from a stolen personal email (that you're a perv says a lot too), decide it was motivated by nefarious intent and that such nefarious intent is common to many people. That you paint a mild-mannered scientist as the devil in disguise says more about you than anything else you've written. I take back what I wrote above. You are more than inclined towards conspiracy ideation. Illuminating too is that you didn't comment on the aspects of my article that related to climate. Only on how your comments are suggestive of conspiracy ideation. Know what? You're confirming suspicions in that regard. Dr Jones didn't mention sacrificing children, you did. You speak of "alarmism"? Go take a good hard look in the mirror! Think long and hard about your own motives for rejecting science and why you flail about looking for someone else to blame.